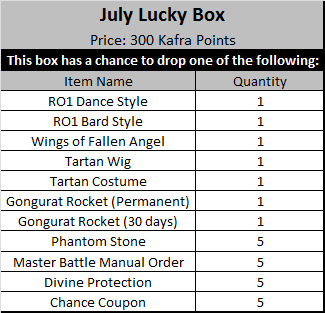 Enjoy July's Hottest Additions to the Kafra Shop! 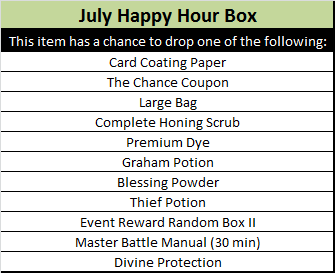 Summer Sale: Diamonds, Storage, and Rune Items! This week's Summer Sale includes half-priced items you need to expand your character's bags, costume, and diamond collection! Many countries celebrate their independence during the summer months. Players from countries around the world unite together in our Kingdom of Rune-Midgarts, and in this Loading Screen Contest we invite you to merge the world of Ragnarok 2 with your real world. Through original art or edited screenshots, show us how you celebrate your country's history. Represent your country through flag, color use, or other patriotic imagery. Entries will be accepted from July 9 to August 13, 2018. Winners will be chosen based on the quality, thoughtfulness, and celebratory feel. Multiple winners will be chosen, and final count will be determined by number of entries received. 1x Cape of Unity, 3 slot, special purple slot version. In addition to participation prize. One more week of HHB!